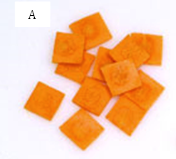 An easy way to remember the vegetables cuts above is that they are all cubes like in shape and they only differ in size except for the julienne which is a very fine strip cut of vegetable. 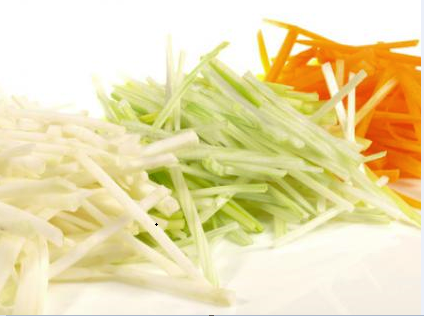 Regarding the way these vegetable cuts are used, it is also not very complicated, the Brunoise and the Julienne cuts are used mostly use as garnish only, usually when serving soup or food on plates for guest or in a fine dining restaurant setting. which could be translated as “vegetable Macedoine salad” which is not named after the country (Macedonia) but after the actual knife cut that you need to apply to the vegetables in the salad. Cut all the vegetables with a uniform Macedoine Cut (except the garden peas)then boil them until tender. when done plunge them in icy water to make sure they are nice and cold then, reserve them in the fridge for about an hour. 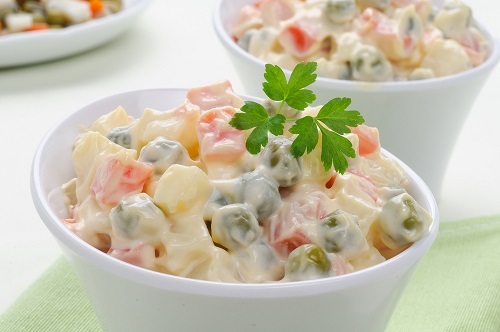 just before serving, mix all the vegetables and the mayonnaise together, place in a dish then serve either in individual portion or let your guest help themselves from a larger salad bowl.